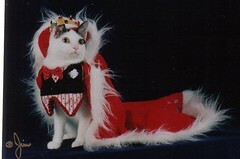 Itchmo: News For Dogs & Cats » Blog Archive » Is Your Cat the Next Mr or Miss Cat Universe? Is Your Cat the Next Mr or Miss Cat Universe? Does your cat have a gorgeous figure? Does he have the hair of a Greek god? Does she know how to master the “cat walk”? Does he have that charming personality (or that je ne sais quoi)? Well, if the answer is yes, bring out your cat’s tiaras and tuxedos and enter them in the 2007 Mr and Miss Cat Universe Pageant! Snap a picture of your beautiful or handsome cat and send it to Catu@pageantuniversity.com by June 15. There is a suggested donation of $5-10 per cat and all the donations will be given to the Quincy Animal Shelter. The website will become live on July 1 and a panel of expert judges will decide who will be the Mr and Miss Cat Universe and they will win fame and loads of prizes (and will rule the feline world). Remember this is for charity, so please no cat fights or hair pulling. This entry was posted on Tuesday, May 22nd, 2007 at 9:19 am	and is filed under Cats, National Dog, Cat & Pet Info, Events for Pets & Owners, Animal Shelters & Charity. You can follow any responses to this entry through the RSS 2.0 feed. Both comments and pings are currently closed. Check out their virtual museum too at the above link!